Does Smoking Cause Weight Gain? Both smoking and weight gain are bad for health individually, and are the leading causes of morbidity and mortality worldwide. Smoking can increase the risk of lung disease, cancer, and heart problems, and excess weight is also a risk factor for heart disease, while at the same time increasing the likelihood of developing type 2 diabetes. The relationship between smoking and weight gain is not entirely straightforward, and advice can often be contradictory. 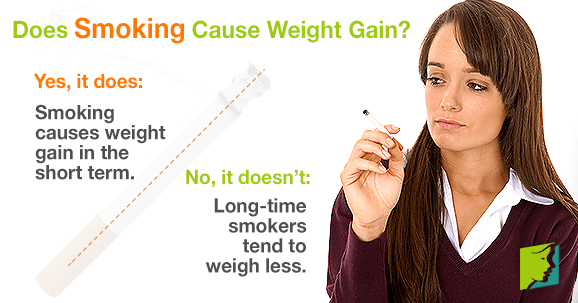 Read on to discover more about smoking and its effect on weight gain. Smoking affects fat distribution, so women who smoke will often find that the fat tends to settle around the waist area, creating an “apple-shaped” body. This is deemed more dangerous than the alternative “pear-shape” and means the person has a higher chance of weight-related diseases. After quitting, the fat will be redistributed, resulting in it migrating to the hip area. Of course, it is healthier to develop dietary and exercise habits that will avoid weight gain after quitting smoking in the first place, but gaining weight below rather than above the waist is preferable, but smoking makes this difficult. Past studies have shown that smoking does cause weight gain in the short-term, but the long-term effects are very different. For a few years after taking up the habit, smokers gain more weight than those who have never smoked. However, this trend seems to reverse itself when the person becomes a long-term smoker; weight gain will fall, meaning the smoker will find herself often thinner than her non-smoking counterparts. Nicotine is a drug that speeds up the metabolism. This is mostly due to the fact that it makes the heart work faster and beat more times per minute, accelerating certain bodily functions. In light of this, it makes sense that people who have been smoking for many years actually weigh less than non-smokers. An oft-reported complaint of people giving up the habit is the weight gain that ensues. This is a real phenomenon, and researchers estimate that as many as 80% of quitters gain weight after ditching the cigarettes. This is due to a number of reasons: physiologically, the metabolic rate is slower, so calories are being burned at a much slower rate. There is also the practical aspect of many smokers using eating as a way of rewarding themselves, or to create the oral satisfaction they have become accustomed to that is now missing. Additionally, food will also taste better after quitting, meaning former smokers will often enjoy eating more than previously. In fact, statistics show that on average, a person giving up smoking can expect to gain 11 pounds (5 kg) within a year. Overall, it can be seen that smoking has undesirable effects on fat distribution and weight gain in the short term, but ultimately is not a cause of long-term weight gain. Many people are reluctant to give up for fear of gaining weight, but this weight gain is not inevitable if a balanced diet and an exercise regime is implemented. Exercise will allow you to enjoy the same dopamine release in the brain that smoking provides, but without the risks of having a stroke or heart attack. Can Coffee Make You Gain Weight? Weight gain is connected to menopause, but it doesn't need to be an irrevocable part of aging. Click here to learn how to minimize weight gain. It can be frustrating for women when they gain weight during menopause, even when they have not changed their habits. Keep reading to learn more.